We successively introduced the new camera models with technical innovations, Nikon FM2 (1982) with the world's first 1/4,000 sec. 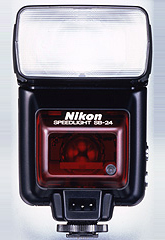 high-speed shutter, Nikon FE2 (1983) with a Speedlight flash sync. speed of 1/250, Nikon FA (1983) with multi-pattern metering, and Nikon F3AF (1983) with automatic focusing (AF). In addition, we planned to offer Nikon F4 as the higher-end model of Nikon F3 (1980) by incorporating the three innovative advanced features, 1) high-speed shutter, 2) multi-pattern metering, and 3) AF. In addition, we also planned to improve water-tightness, reduce shutter sound, and a brighter finder screen. In August, we contracted Giorgetto Giugiaro, who had been so successful in the designing of Nikon F3, Nikon EM, and Pikaichi, to design the new model on the basis of conventional dial or lever operation with limited keyboard (pushbutton) operation in order to realize a unit that would meet the specifications involving the various features in a compact design. Furthermore, we planned to incorporate cutting-edge technologies for minimized error in distance measurement and metering and improved weather resistance, and then focused on the enhancement of the basic performance characteristics of cameras, which we had overlooked because we had been paying more attention to automated operation. Super-high shutter speed of 1/8,000 sec. achieved with the development of shutter blades made from an ultra-lightweight compound material (carbon fiber compound) which is lighter and more durable than titanium. Our first use of Focus Tracking with Lock-On, to provide optimum focusing by determining any displacement of the focus point of a moving subject based on the distance measurement data obtained while the shutter release button is half-pressed, and then moving the lens additionally to compensate for the displacement of the focus point. High-speed winding at 5.7 frames per sec., when used with the high-power battery pack MB-21 (1.5V LR6 alkaline battery x 6). Adoption of shutter balancer and resultant decreased shutter-shake. Reduced error in detection of focus point by selecting the appropriate one of two filters for AF sensor depending on shooting conditions (infrared cut filter for normal photography and infrared filter for infrared active fill-in light). Optimized metering attained in vertical format photography by means of the vertical format sensor for multi-pattern metering. 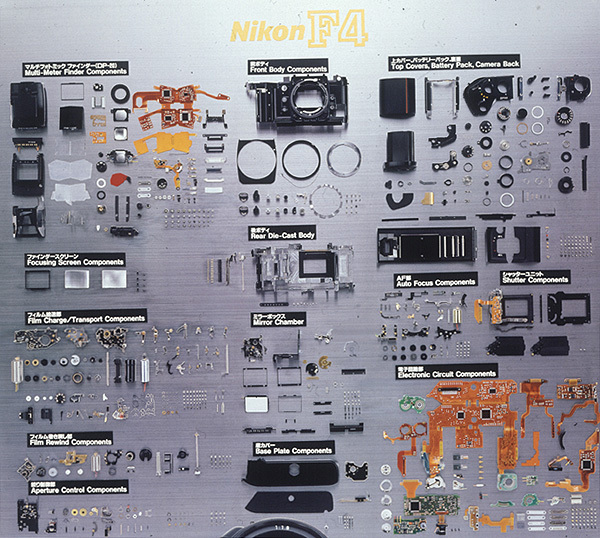 Nikon F4 was put into commercial production in June 1987. In response to this, the Camera QC Division planned to reinforce the quality assurance programs to ensure the best possible quality. For example, concentrated software debugging activity, shutter reliability evaluation activity, preparation of part quality standards, introduction of "QC Process Chart" including the control point, target value and control method in the Assembly Process Chart, and other programs were introduced, which helped to provide the basis for the quality control activities for individual models following F4. 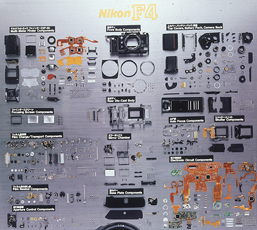 In this way, the flagship SLR camera Nikon F4 aimed at pro-spec became the possibly largest-scale camera with 1,850 body part numbers, a communication network with a maximum of 7 CPUs, and sophisticated software holding 43 million ways of operating conditions. In September 1988, Nikon F4 (with the battery pack MB-20 containing 4 AA batteries) and Nikon F4S with the high-power battery pack MB-21 (AA battery x 6) supplied as standard in the F4 were put on sale simultaneously at home and abroad in U.S. and Europe. Prior to the release, demonstration models were rented out to the worldwide news photographers at the Nikon Service Depot opened at the Main Press Center for Seoul Olympic Games held in the Republic of Korea. Then, in early October, the models were displayed at '88 Photokina held in Köln, Germany. At first, we made a conservative estimate of the sales volume of F4. However, with the announcement of the release, orders came pouring in for the product both at home and for export, and the scheduled supplies were exceeded early. The scheduled release date was postponed by about one month, and release was made in December simultaneously worldwide. For the release of F4, we made our best effort to establish the image of a most advanced, cutting-edge, and highest-end model, and to ensure that information and service would be provided to professional photographers, the main customers for this product. 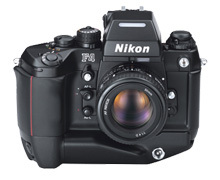 The suggested retail price of F4 was 284,000 yen at the time of release (with the AI AF Nikkor 50 mm f/1.4S), though it was changed to 259,000 yen (consumption tax excluded) in response to the abolishment of a commodity tax and introduction of a consumption tax in April 1993. In addition, the favorable reputations for F4 helped win various prizes as listed in the table below. Also in some countries, F4 won individual commendations from newspapers and photographic magazines. For the F4 series released as an AF SLR camera for professionals and advanced amateurs, F4E (with the multi-power battery pack MB-23 as standard) was added in April 1991, and the sales volume reached 93,000 with the export of 137,000, totaling 230,000 units in three years by the end of 1991. From 1985 onwards, system camera became prevailing in the AF SLR camera sector, and by 1989 AF models accounted for 90% or more of the SLR cameras sold in the home market. We developed and trial- manufactured AF Nikkor 80 mm f/4.5 lens in 1971 and took a step forward toward the realization of AF SLR cameras. 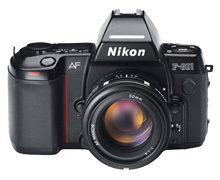 In 1983, Nikon F3AF and two AF lens models with the motor built-in in the lens were put on sale. In 1986, the mid-range model body-powered AF Nikon F-501 went on sale, and in 1987 the lower-price model with Speedlight built-in AF Nikon F-401 followed. 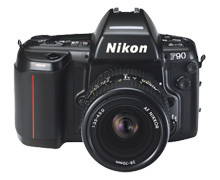 In addition, in June 1988, Nikon F-801 was put on sale as a high-end model with the 1/8,000 sec. high-speed shutter and other various new technologies. 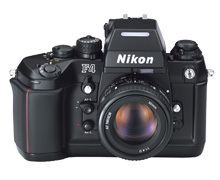 In December of that year Nikon F4 and Nikon F4S were released. 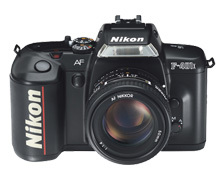 From 1989, the AF models Nikon F-401S, Nikon F-601, Nikon F-801S, and Nikon F-401X were successively introduced. These AF models placed emphasis on well-balanced, easy-to-operate cameras with advanced exposure control and other features, not focusing only on the AF control. Our share accounted for 19.4% in 1989 and 22.7% in 1991 of the domestic AF SLR camera (in accordance with the survey by Tokyo Research). 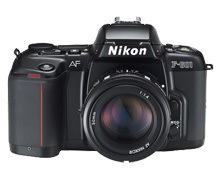 In September 1992 Nikon F90, Nikon F90D, and Nikon F90S were put on sale. This F90 series offered the enhancements of the basic performance in direct connection with image quality, including the 3D-8 segments multi-pattern metering to provide correct exposure based on three types of information (dimensions): maximum brightness, difference in brightness and distance to the target object, with the D-type lens designed to transmit distance information. In particular, the world's first 3D Multi-Sensor Balanced Full-Flash exposure control, when combined with the D-type lens and Speedlight SB-25, provided the Monitor Flashing feature to identify the subject condition in the instant immediately before the final flashing, using the insulated gate bipolar transistor for the flash control element of Speedlight, thereby enabling the user to obtain correct exposure even in shooting conditions in which Speedlight had been difficult to handle. We applied the Speedlight to practical use first in 1962 with the integration into the Medical Nikkor lens for medical use. Subsequently, we offered SB-1 in 1969 and the Speedlight SB-2 in 1972 featuring the world's first SCR-based (thyristor) automatic flash exposure control. Based on the consideration that the Speedlight would play an important role in system cameras, we had been supplying various models for a variety of applications including close-ups, UV/infrared photography and underwater in addition to general purpose cameras. For the basic performance, we had increased the light intensity, expanded the illuminating angle, reduced the recycling time loss, and also improved the ease of operation by reducing the size of the external power pack, and introducing auto zooming to automatically respond to the shift of focus of the zoom lens. In addition, we succeeded in developing the TTL automatic flash control to measure the light reflected from the center of the film plane, which was incorporated in SB-12 for Nikon F3 (released in 1980). This innovation evolved into the Matrix Balanced Full-Flash Control in SB-24 (released in 1988) for use with Nikon F-801 and F4 series, which measures the light intensity at different segments of the film and controls the flash exposure in consideration of proper balance between subject and background. Then, Speedlight became able to determine optimum flash exposure based on feedback with the light metering information by the camera, making it easier to obtain the correct exposure. This technical innovation contributed to the development of the 3D Multi BL Flash Control in SB-25 which had the capability of capturing information about subject distance and monitor flash exposure. As the lineup of AF SLR camera models increased, the lineup of interchangeable lens for AF SLR camera also expanded and reached a total of 24 models in February 1992. However, professional photographers were asking for greater AF speed (in terms of the super telephoto lens in particular). In order to meet the request, we developed a lens integrated with the motor drive, and released two telephoto lens models including AI AF-I Nikkor 600 mm f/4 IF-ED and 3 zoom lenses including AI AF Zoom-Nikkor 80 - 200 mm f/2.8D in September. 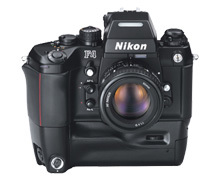 While the AF models were prevalent in the SLR camera market, we released the MF type Nikon F-601M (body alone at suggested retail price of 65,000 yen, consumption tax excluded) in conjunction with the AF type Nikon F-601 in September 1990 for users who remained persistently in favor of the MF (manual focusing) type. Nikon F-601M was designed by eliminating the AF, built-in Speedlight and spot metering from the F-601 series and modifying the focusing screen to the micro split matte suited for MF. As of September 1989, 57 models. As of April 1990, 56 models. As of July 1992, 56 models. As of September 1994, 56 models. As of March 1996, 55 models. As of February 1998, 45 models. As of March 2000, 37 models. In 2001, AI Nikkor 45 mm F2.8P was put on sale. The models released from April 1989 onwards do not include the consumption tax in the suggested retail prices. For our all-weather cameras, since the first introduction of NIKONOS in 1963, improvement had been made repeatedly to offer NIKONOS-V (Five) (April 1984), during which the automatic control of exposure and Speedlight made remarkable progress. 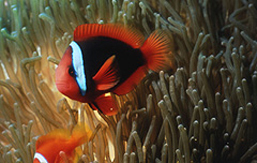 In practice, however, underwater photography often entails close-up shot due to the lower clarity and bluish color of the water. Then, use of NIKONOS series, which involved distance measurement with the eye for focusing and framing through direct optical viewfinder, required the photography skill sophisticated to a certain level. In addition, the request came from an increasing number of users for the full-scale AF camera specifically designed for underwater photography without housing. Then we projected to develop the single-lens reflex camera to allow easy and accurate focusing and framing, and started the basic investigation in 1986. Later, we came to be confident to provide satisfactory performance in the water with advancement of AF technology, and stepped forward to commercialization of the special underwater AF SLR camera in December 1988. 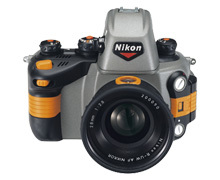 The newly developed NIKONOS RS AF to allow AF photography in the water to a depth of 100 m was added to the lineup of our AF SLR camera series, and exhibited for reference in the DEMA Show (January 1992) at Houston, U.S., for diving equipment and materials, PMA Show (February) at Las Vegas, and Diving Festival (March) and Japan Camera Show (March) held in Japan, and then released in June (body alone at suggested retail price of 390,000 yen, consumption tax excluded). As the compatible lenses, three models were first put on sale, R-UW AF Nikkor 28 mm f/2.8, R-UW AF Micro Nikkor 50 mm f/2.8, and R-UW AF Zoom-Nikkor 20 - 35 mm f/2.8, simultaneously with the multifunctional underwater Speedlight SB-104. The Coordinating Committee for Multilateral Export Controls (COCOM) composed of a total of 16 free nations including Japan had been working to prevent the export of any strategic materials and technologies to the Communist bloc countries and the countries supporting international terrorism. The Japanese Government revised the export-related laws and regulations in response to the so-called Toshiba Machine case in 1987, and called on individual companies to strictly observe the laws and regulations. We formed the Export Assessment Committee (Secretariat located in what was then the Planning & Administration Section of Overseas Administration Division) in November 1987, to ensure the strict observance of the export-related laws and regulations. In June of 1988, in accordance with the Notice by the former Ministry of International Trade and Industry, we established the Basic Policy and Rules for Observance of Export-related Laws & Regulations and formed the Export Administration Review Committee. 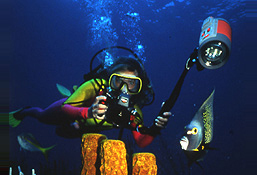 As the NIKONOS RS AF was the world's only camera to allow AF shots without any housing in water to a depth of 100 m, it was specified as falling under the Strategic Materials in accordance with the COCOM Regulations (= Controlled Freight specified by the Foreign Exchange and Foreign Trade Control Law and the Export Trade Administration Act) and thus subjected to very severe controls for export or transportation out from Japan and COCOM member nations to any other countries. These regulatory restrictions exerted a large negative effect on the sales volume and available sales periods of NIKONOS RS AF.